On Wednesday September 7th the Deventer Historical Museum announced an important new purchase. 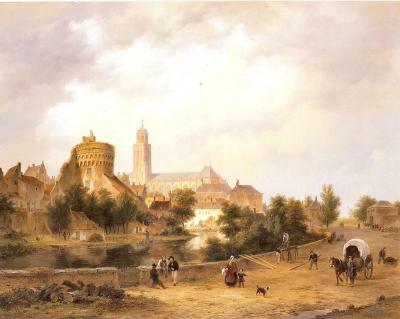 It concerns the painting 'View on Deventer' by the Romantic artist B.J. van Hove (1790-1880), bought at Leslie Smith Gallery. Van Hove was a remarkable influential painter in the 19th century and was one of the founders of Pulchri Studio, the most important artist studio in The Hague. The painting 'View on Deventer' (oil on panel, 69 x 88 cm) is a beautiful example of a 19th century Romantic town view. Van Hove painted the piece in 1846, during the heydays of his career. 'It is an honour that, after having sold a piece to the Van Gogh Museum earlier this year, another work from our collection has been sold to an important museum and is therefore being preserved as cultural heritage', quotes David Smith, director of Leslie Smith Gallery.